Shelf Life: 24 months. Refrigerated. 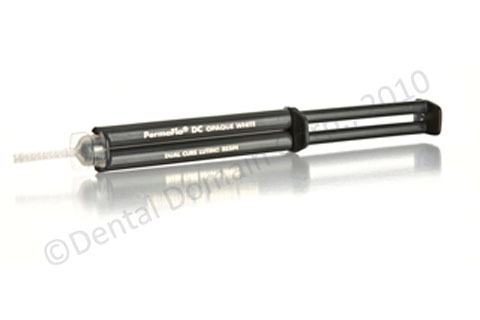 PermaFlo DC Composite Luting/Restorative Resin in conjunction with Peak Universal Bond is designed to provide chemical polymerization of the luting resin beneath indirect restorations and endodontic posts which are accessible and inaccessible to light. It can be light cured for transparent restorations, i.e. onlays, inlays, and porcelain crowns. It is designed for direct restorations as an initial layer and/or bulk fill for posterior bonded composites and core material prior to crown fabrication. Delivery includes 5 flow tips.